Brandon Tatum, director of urban engagment for TPUSA, (top) was one of two speakers. Freshman sports managment major Jance Espaillat engaged in a verbal disagreement and left the event. 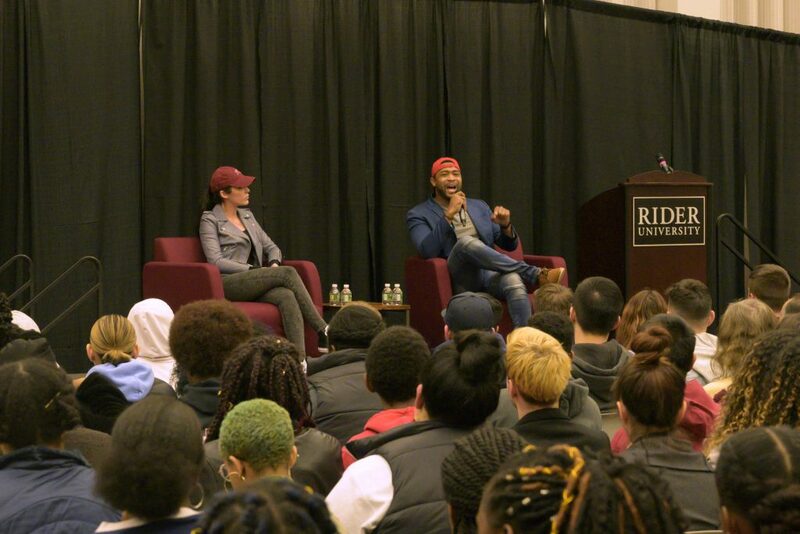 Several disruptions broke out in the midst of overwhelming audience opposition at Rider’s chapter of Turning Point USA’s (TPUSA) “White Privilege is a Myth” event on April 2, as controversial speakers Brandon Tatum and Anna Paulina addressed a crowd of over 400 people in the Cavalla Room. Tatum, director of urban engagement at TPUSA, and Paulina, director of spanish engagement at TPUSA, leaned on personal anecdotes to submit their viewpoint that white privilege is not something prevalent in American society. While the speakers made their arguments and answered questions on stage, conflicts arose in the crowd between a number of individuals. 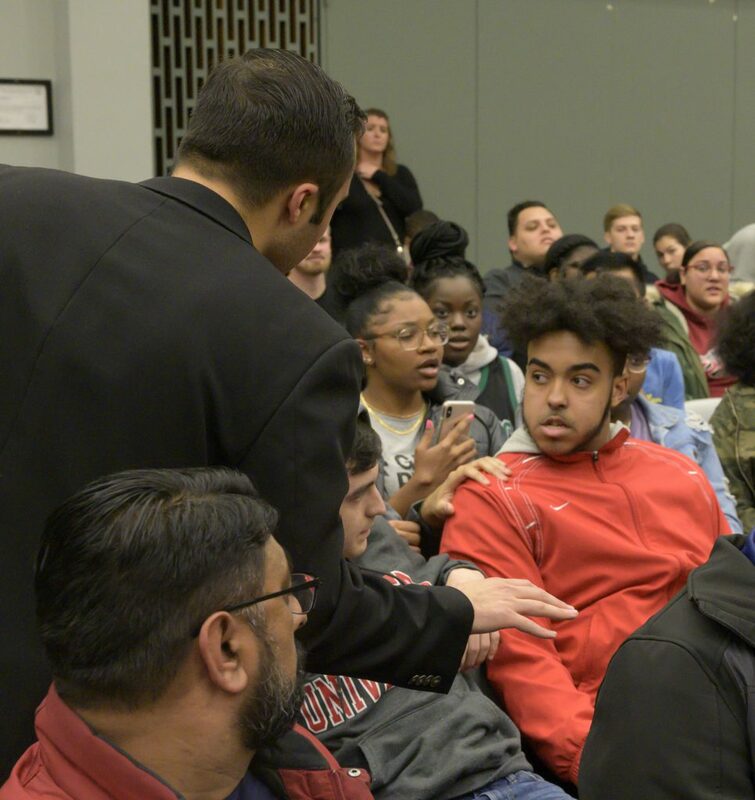 A little over 10 minutes into the event, a dispute erupted, where freshman sports management major Jance Espaillat, who is of Dominican descent, jumped up in defense of his friend after an unidentified white man turned around and said an expletive in their direction, according to Espaillat. He left the event. Senior popular music studies Alexis Green questions speakers’ stance on privilege. A number of students with event tickets were prevented from attending. In addition, Michael Schoch, assistant director for training, recognition and leadership denied a Rider News reporter access to the event. Rider’s Media Access Policy operates under “a presumption of openness.” Assistant Professor of Journalism and The Rider News’ Faculty Advisor Jackie Incollingo expressed deep concern that a member of the media was denied access. The reporter was not the only individual denied access to the event. A line of students and community members formed at the door after being denied entry because they did not have wristbands that were distributed by TPUSA members prior to the event. A majority of them, however, did have tickets. Although the event was publicly advertised on campus, a number of students were denied entry because they lacked wristbands. The wristband requirement was not previously advertised. Sophomore political science major and secretary of TPUSA at Rider Ting Wei expressed deep contempt for the outcome of the event. “[The event] was chaotic, messy and displayed, in my opinion, the worst of political discourse in America,” said Wei. There were reports of several verbal altercations following the event. No arrests were made, according to Public Safety. Across campus, an event entitled “Seeing Privilege,” organized by the Sociology Department, was hosted in Lynch Adler Hall. The event was standing-room only as guests sat on the windowsills and ground of the conference room while moderator and Professor of Sociology Richard Zdan hosted a panel that included Associate Professor and Chair of Sociology and Criminology Victor Thompson, Associate Professor of History and Director of the Gender and Sexuality Studies Program Erica Ryan and Professor of Political Science Frank Rusciano. The event was much tamer than the TPUSA event and the panelists presented arguments that focused mostly on the historical background of why white privilege is an issue that society must continue to address. “The claim that white privilege is a myth is a broken claim,” said Thompson.